Southern greens are traditionally made with smoked ham hocks or turkey bones and cooked for long hours. This easy and quick recipe from Brazil allows you to make greens in no time at all while keeping them a beautiful sparkly emerald green. You get to retain more the nutrients and get of the kitchen faster. You can make kale, swiss chard, or any greens in this manner. Known as Couve a Mineira in Brazil, these garlicky collard greens are a condiment to the national dish Feijoada a stew of Black Beans with a variety of smoked meats. Because collard greens are a cool season vegetable this a great side dish to try during the Kwanzaa holiday season. The most Africans outside of Africa are in Brazil. They have contributed to a rich culinary heritage and cuisine that is being noticed after the World Cup and their emerging economy. 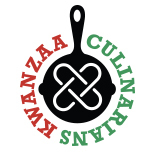 This entry was posted on December 18, 2014 by Kwanzaa Culinarians in 2014, Recipe and tagged African, Brazil, Brazilian Collard Greens, Couve a Mineira, Global Local Gourmet, Nadine Nelson.